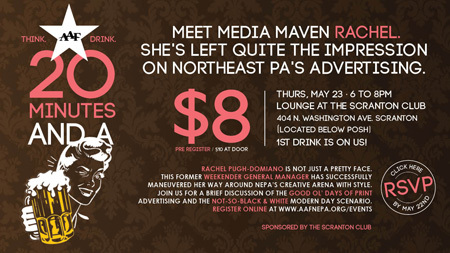 The American Advertising Federation (AAF) of Northeast Pennsylvania’s next 20 Minutes and a Beer event will feature Rachel Pugh Damiano, former Weekender General Manager, discussing her experience in print advertising as well as the current state of marketing in the region. The event is scheduled for Thursday, May 23, from 6-8 p.m. at The Scranton Club, 404 N. Washington Ave., Scranton, PA; and we’d encourage anyone interested in marketing, advertising or creative design to attend. Tickets are $8. BlackOut’s Jessica Siegfried is the Director and Past President of AAF Northeast Pennsylvania. You can register for the May 23 event on their website.